Bermuda is quickly becoming one of the most coveted fishing locations in the world. There are always fish to be caught in Bermuda. 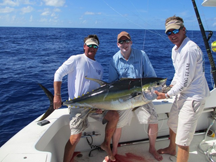 Marlin fishing in the crystal clear blue waters just off the coast, two banks offering premium Wahoo and Tuna fishing, and coral reefs that are home to groupers, Snappers, jacks and a host of other species. Reel Addiction is always ready for the big catch – Spring, Summer, Fall or even Winter. 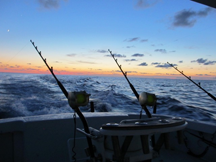 Tuna and Wahoo are caught throughout the year, with the greatest numbers being recorded in the Fall and Spring. 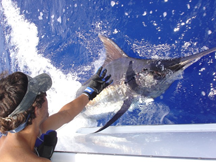 The Marlin begin to arrive in early summer and are here through August. Come discover Bermuda’s deep sea action on Reel Addiction! Reel Addiction wins the coveted Best of Bermuda award. The annual Best of Bermuda awards aren’t given out lightly. Chosen by an impartial panel of judges, awards are handed to those who have distinguished themselves as the Best in Bermuda. Well done to Captain Craigin and his team! What trip wouldn’t be complete without mementos? Stop by the Gallery to see some of the catches from our past adventures!